The price of one ounce of gold increased by 2.4395 manats or 0.11 percent last week in Azerbaijan. Accordingly, the average price of one ounce of gold stood at 2,194.734 manats. Last week in Azerbaijan, the price of one ounce of silver decreased by 0.028 manats or 0.11 percent. Accordingly, the average price of one ounce of silver stood at 26.4918 manats. 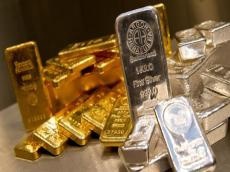 Last week, the price of one ounce of platinum increased by 8.3895 manats or 0.61 percent. Accordingly, the average price of one ounce of platinum stood at 1,370.2663 manats. Last week, the price of one ounce of palladium increased by 178.5425 manats or 7.99 percent. Accordingly, the average price of one ounce of palladium stood at 2,294.6124 manats.